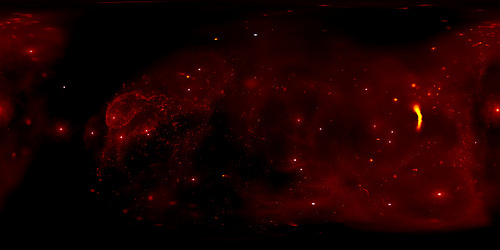 Edited Chandra Space Telescope visualization of the center of the Milky Way Galaxy (our galaxy), with lots of stars and gas and energetic processes. Annotated by NASA and distorted by me. Original caption: A new visualization provides an exceptional virtual trip — complete with a 360-degree view — to the center of our home galaxy, the Milky Way. 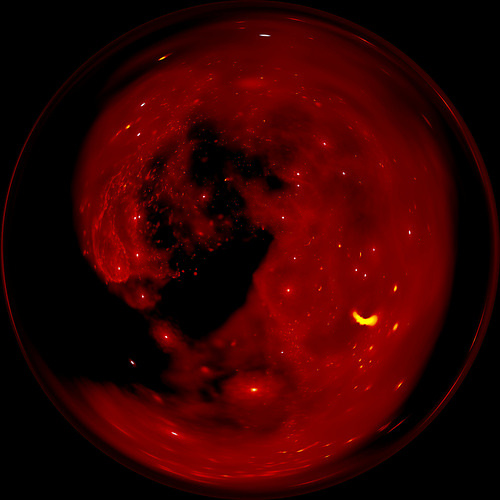 This project, made using data from NASA’s Chandra X-ray Observatory and other telescopes, allows viewers to control their own exploration of the fascinating environment of volatile massive stars and powerful gravity around the monster black hole that lies in the center of the Milky Way. This visualization builds on infrared data with the European Southern Observatory’s Very Large Telescope of 30 massive stellar giants called Wolf-Rayet stars that orbit within about 1.5 light years of the center of our Galaxy. Powerful winds of gas streaming from the surface of these stars are carrying some of their outer layers into interstellar space. Astronomers are interested in better understanding what role these Wolf-Rayet stars play in the cosmic neighborhood at the Milky Way’s center. In particular, they would like to know how the stars interact with the Galactic center’s most dominant resident: the supermassive black hole known as Sagittarius A* (abbreviated Sgr A*). Pre-eminent yet invisible, Sgr A* has the mass equivalent to some four million Suns. Christopher Russell presented this new visualization and the related scientific findings at the 231st meeting of the American Astronomical Society in Washington, DC. Some of the results are based on a paper by Russell et al published in 2017 in the Monthly Notices of the Royal Astronomical Society. An online version is here. The co-authors of this paper are Daniel Wang from University of Massachusetts in Amherst, Mass. and Jorge Cuadra from Pontifical Catholic University of Chile. NASA’s Marshall Space Flight Center in Huntsville, Alabama, manages the Chandra program for NASA’s Science Mission Directorate in Washington. The Smithsonian Astrophysical Observatory in Cambridge, Massachusetts, controls Chandra’s science and flight operations. Edited Chandra Space Telescope visualization of the center of the Milky Way Galaxy (our galaxy), with lots of stars and gas and energetic processes. In celebration of the 17th anniversary of the launch and deployment of NASA’s Hubble Space Telescope, a team of astronomers is releasing one of the largest panoramic images ever taken with Hubble’s cameras. It is a 50-light-year-wide view of the central region of the Carina Nebula where a maelstrom of star birth – and death – is taking place. Hubble’s view of the nebula shows star birth in a new level of detail. The fantasy-like landscape of the nebula is sculpted by the action of outflowing winds and scorching ultraviolet radiation from the monster stars that inhabit this inferno. In the process, these stars are shredding the surrounding material that is the last vestige of the giant cloud from which the stars were born. The fireworks in the Carina region started three million years ago when the nebula’s first generation of newborn stars condensed and ignited in the middle of a huge cloud of cold molecular hydrogen. Radiation from these stars carved out an expanding bubble of hot gas. The island-like clumps of dark clouds scattered across the nebula are nodules of dust and gas that are resisting being eaten away by photoionization. This image is a mosaic of the Carina Nebula assembled from 48 frames taken with Hubble Space Telescope’s Advanced Camera for Surveys. The Hubble images were taken in the light of neutral hydrogen. Color information was added with data taken at the Cerro Tololo Inter-American Observatory (CTIO) in Chile. Red corresponds to sulfur, green to hydrogen, and blue to oxygen emission. In its 17 years of exploring the heavens, NASA’s Hubble Space Telescope has made nearly 800,000 observations and snapped nearly 500,000 images of more than 25,000 celestial objects. Hubble does not travel to stars, planets and galaxies. It takes pictures of them as it whirls around Earth at 17,500 miles an hour. In its 17-year lifetime, the telescope has made nearly 100,000 trips around our planet. Those trips have racked up plenty of frequent-flier-miles, about 2.4 billion, which is the equivalent of a round trip to Saturn. The 17 years’ worth of observations has produced more than 30 terabytes of data, equal to about 25 percent of the information stored in the Library of Congress. Each day the orbiting observatory generates about 10 gigabytes of data, enough information to fill the hard drive of a typical home computer in two weeks. The Hubble archive sends about 66 gigabytes of data each day to astronomers throughout the world. 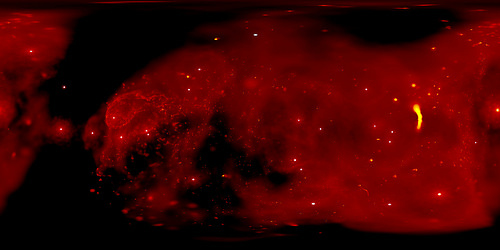 Edited Chandra Space Telescope visualization of the center of the Milky Way Galaxy (our galaxy), with lots of stars and gas and energetic processes. Processing variant. 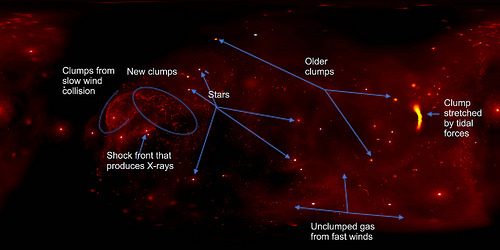 Edited Chandra Space Telescope visualization of the center of the Milky Way Galaxy (our galaxy), with lots of stars and gas and energetic processes. 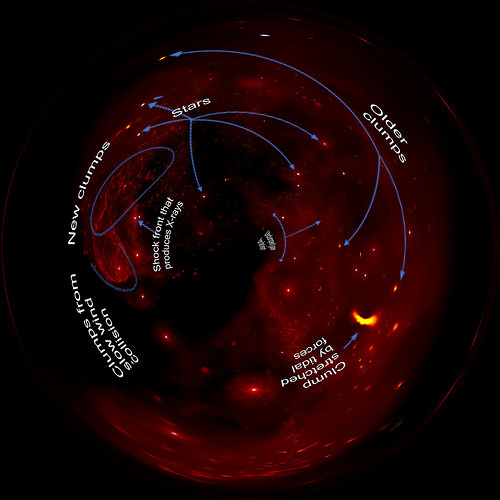 Annotated by NASA. Edited Chandra Space Telescope visualization of the center of the Milky Way Galaxy (our galaxy), with lots of stars and gas and energetic processes. Geometric variant.